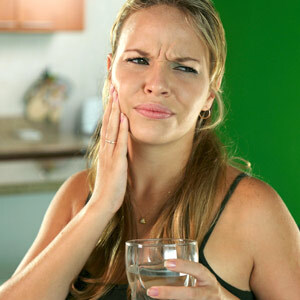 You may be among the one in three Americans who suffer from the pain of tooth sensitivity. Before attempting treatment, though, we must first identify the cause. Your teeth are made of layers of different organic tissue. The pulp at the center of the tooth contains nerves that transmit pain or pressure sensation to the brain. The pulp is encased by dentin, a layer of tissue composed of tiny tubules that conduct temperature and pressure changes from outside the tooth to the pulp nerves. The hard outer enamel shell shields the dentin from over-stimulation from these sensations. There are, however, some instances where the dentin may become exposed and cause sensitivity in the tooth. This can occur when the gum tissue recedes and the root of the tooth is exposed to the oral environment. If the root loses its surface coating (referred to as cementum, a cement-like outer layer around the root surfaces) because of over-aggressive brushing (too hard for too long) or advanced periodontal (gum) disease, sensitivity is often the result. Another instance is enamel erosion. Although made of the hardest substance in the human body, enamel has one major enemy — acid. A high oral acid level brought on by over-consuming acidic foods and beverages or as a symptom of gastric reflux disease dissolves (de-mineralizes) the enamel’s mineral content. Brushing just after eating actually contributes to de-mineralization because the enamel is in a softer state. It requires forty-five minutes to an hour for your saliva to neutralize acid and restore minerals to the enamel — you may actually be brushing away enamel with this practice. Once we know the underlying cause, we can use an appropriate method to reduce sensitivity. One way is to reduce nerve sensitivity in the dentin’s tubules or block them altogether. There are several chemical products for both home and dental office application that can reduce sensitivity and encourage enamel re-mineralization (as can the fluoride added to toothpaste). We can also strengthen enamel and provide a mechanical barrier to acid through concentrated fluoride in a varnish applied to tooth and root surfaces. And, life-like restorations like crowns or veneers not only improve the appearance of your teeth, they can also provide coverage for exposed dentin. If you are experiencing painful sensitivity, make an appointment to visit us. Once we know the source, we can treat the problem and reduce your discomfort.